Sunday Brunch at Thyme Restaurant is the perfect way to cap off your weekend! Enjoy delicious breakfast and lunch selections served up buffet-style, every Sunday. Drink specials include $3 Mimosas and Bloody Marys. Browse the brunch menu or make a reservation online. Sundays are for brunch! Enjoy delicious breakfast and lunch menu selections served up buffet-style. Get family and friends together for a new Sunday tradition: the best Sunday Brunch in the Lehigh Valley! Private brunch events are available. Please click here to submit a request for more information. Fresh From the Bakery: Assorted breakfast breads, butter, cream cheese, jelly and jams.Omelet Station: Build you own omelet! Choose from diced peppers and onions, mushrooms, chopped tomatoes, bacon, sausage, diced ham, asparagus and shredded cheese.Breakfast Chafing Dishes: Bacon, sausage, cheese blintz with fruit sauce, Belgian waffles with brown sugar and maple syrup, home fries, fresh fruit and berries.Hot Entrees, Stations & Dessert: Chef's choice of pasta, hot entree and dessert. Join us for "Bend & Brunch" -- a special yoga class and optional brunch -- on the first Sunday of each month! 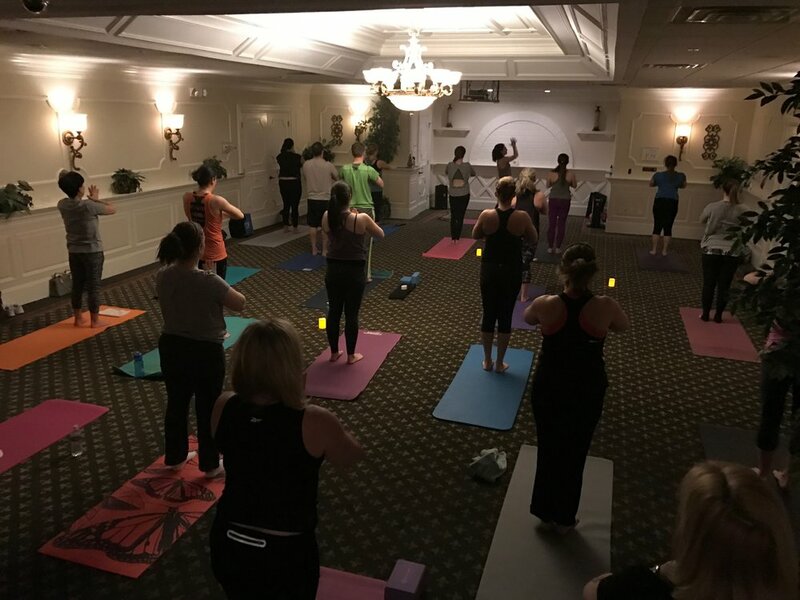 Yoga classes are taught by registered instructor, Samantha Turco. Over the past 4 years, Sam has been teaching vinyasa-based yoga throughout New Jersey and Pennsylvania. She will start your day off by guiding you through a mixed-level flow for 45 minutes followed by a delicious brunch upstairs in our ballroom. Registration is required. LOOKING FOR MANTRAS & MARTINIS? CLICK HERE! Bend & Brunch is scheduled to take place on the first Sunday of each month. All class dates and times are subject to change.